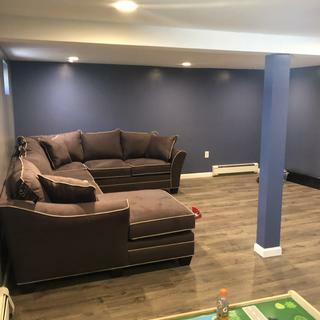 My wife and I were looking to buy a sectional to be the centerpiece of the open layout living/dining rooming our new home. When I saw this Foresthill 4-piece, I knew my wife would love it. When she came with me to see it in person, it was a done deal. It’s extremely stylish and comfortable, and looks amazing in our new home. Thanks Karen! Overall great sectional other than the color issue. Color looks much browner than advertised in brochure and website. Also model in store was actually closer to black. I ordered slate but it looks brown. Can pieces be added to this? BEST ANSWER: Hello Marty! To order additional pieces, please contact 866.383.4484, option 2 or visit your local Raymour & Flanigan showroom. Yes, additional pieces can be added with no problems. This sectional is such a great looking set and also so comfy. Yes, you can add pieces. What is the inside seat depth? BEST ANSWER: Hi Jennifer, the seat depth is 22". do you have a floor plan layout with dimensions for this unit? 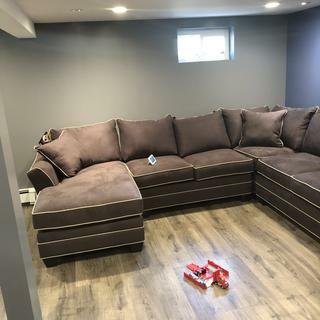 BEST ANSWER: The overall dimensions for the Foresthill 4-piece sectional are L: 126" x W: 100" x H: 38" which converts to about 10.5 ft x 8.5 feet. We would be happy to help suggest what sectional is the best for your room size. Please contact your local showroom or our online sales department, 866.383.4484, option 2! 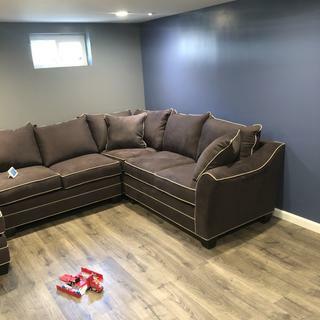 Are the back cushions attached, or separate from the frame?